Biafra: A Dramatic Twist In Kanu’s Trial, What Follows Next? 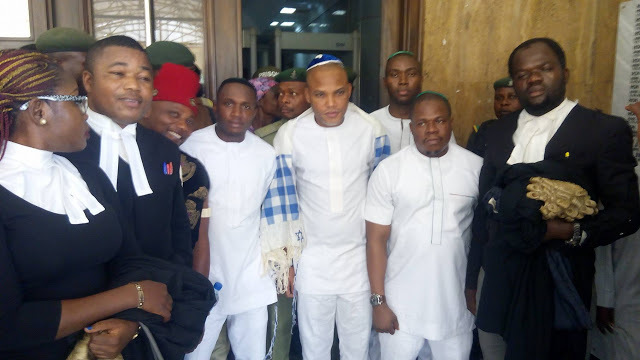 It has really been a very dramatic twist in the continued trial of leader of the Indigenous People of Biafra, IPOB, Nnamdi Kanu at a Federal High Court, sitting in Abuja, following the severance of his trial from the rest of other three defendants charged alongside with him. What this 'severance' (which was not objected by the parties involved) means in essence, was that the IPOB leader’s trial has been effectively put on hold until issues surrounding his whereabouts since September last year after the military invasion, are being resolved. Albeit the court has summoned Kanu’s three sureties to appear before it on March 28, 2018 to “personally explain why Kanu has been absent from court, and for purpose of any applications in that regard,” the matter still revolves round trying to fathom his whereabouts without which his trial cannot proceed. In an interview with The Biafra Times Correspondent shortly after Tuesday’s proceedings, lawyer to the IPOB leader, Barrister Ifeanyi Ejiofor, stated that “the sureties will come to court and say that the person we took on bail, look at what happened to him. They have the facts, evidence, the video clips of what transpired in his(Kanu’s) house. So, they would come to inform the court formally. He further noted that he told the court that despite the fact that his client was enjoying the bail as granted by the court, the federal government invaded his house, killing scores of people and took him away, hence they are at best position to provide him, noting that his client was ever ready to stand for trial before the unholy invasion by operatives of the Nigerian military. Having made that clear, it now behooves on the integrity of the court to carefully x-ray those detailed information(s) at its disposal, provided by counsels to the sureties in determining the fate and status of Nnamdi Kanu in the trial. The presiding judge, Binta Nyako, would definitely going to find it a herculean task in trying to determine the whereabouts of the IPOB leader, since the miliary whose men invaded his compound and allegedly took him out of circulation, is still in the business of denial as to what became of their victim. It is most likely that the judge not seeing Nnamdi Kanu for a long time, would have to keep his trial pending until when he is sighted again. But whether Kanu’s trial would be called-off temporary or permanently, is left to be seen. Meanwhile, in another related development, lawyer to another Biafra detainee, Bright Chimezie, has decried the inability of the court to properly and officially arraign his client before it which was brought about by the inability of the Department of State Services, DSS, to move the motion for the amended charge which they dumped in court since June last year. According to the lawyer, Chukwudi Igwe, who informed that his client has a subsisting bail granted him by a Federal High Court in Uyo, Akwa Ibom State, the DSS vehemently refused to obey that order but rather joined him in Kanu’s suit in Abuja High Court, on amended charges which has not been mentioned in court. “We reminded the court that about 7 months ago, we wrote to remind it that our client has been in the custody of the DSS for a very long time. We filed a motion for his bail at the Federal High Court, Uyo which granted that request. “The court mandated the DSS to release my client immediately but that they did not do, so we came to this court. I told this court that it has a copy of the amended charge which has been served on my client and dumped before the court. “The prosecution refused to present or move the application for the amended charge, so that my client can formally come in. That, they also refused to do. We told the court that if they do not want to move the application for the amendment of the charge which has already been filed before the court, should be struck out of the court so that we can enforce the judgment delivered in favour of my client in Uyo Federal High Court,” he said. Although the court has stated that excluding Kanu from other defendants would give chance for Bright Chimezie, arrested sometime in 2016, to now join the suit, adding that if on the next adjourned date, which is March 20, the prosecution fails to move the application, the matter involving the Biafra activist, would be struck out.